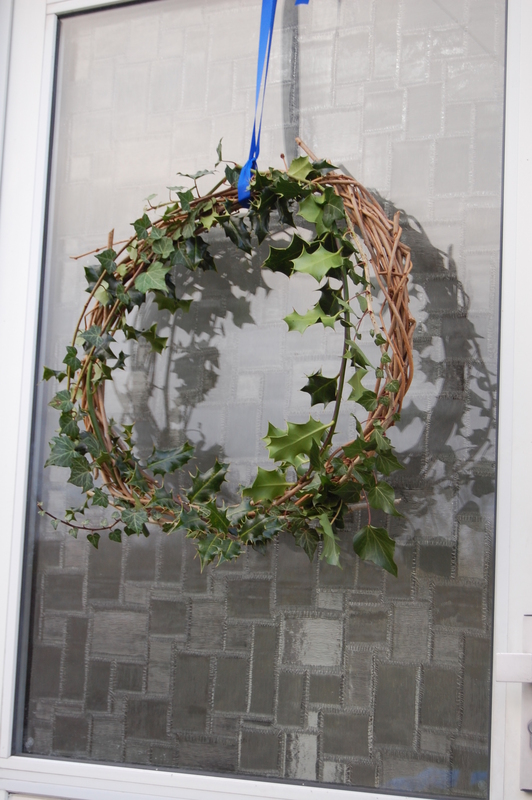 I thought I’d have a go at making a wreath for the first time. It was quite fiddly but very satisfying and quite therapeutic. I got a whole lot of bendy twigs which my mum had in her shed (my mum has everything – no, actually, everything). 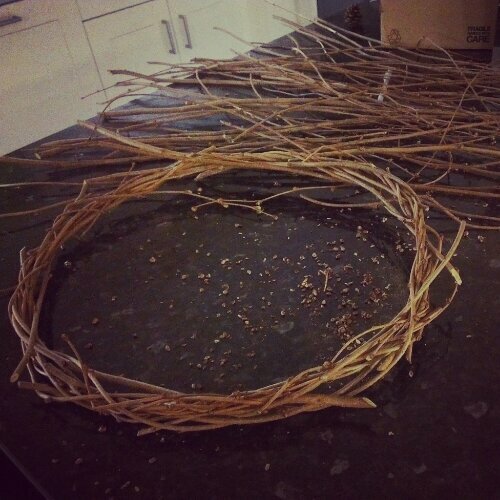 Then I twisted them together into a fairly large sort-of-circle, about 50cm diameter. It took a lot of twisting and some weird holding but it finally started to look like a circle. After twisting in a few more twigs, I found some holly and ivy (seasonal!) and poked the ends in to gaps between the twigs. Not a work of finesse but it did the job. I deliberately left mine fairly sparse as I wanted a natural look but tied it up with a bright blue ribbon to go with the bright greens and blues I’m using this Christmas. And hung it on my front door! I’m not sure this photo does it justice but the ugly/ retro glass door is tricky to photograph! I have no idea how long the holly and ivy will stay looking green for but hopefully I’ll be able to use the wreath base next year. And I’m also hoping I’ll have a new door to hang it on by then!